Monica Sheets is installing a large-scale neon sign created in collaboration with Ne-Art Custom Neon in Northeast Minneapolis on the Soap Factory’s roof. 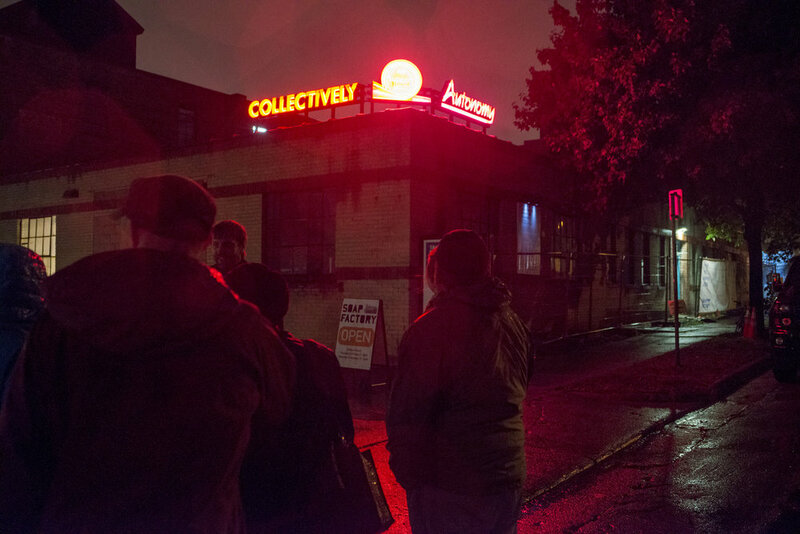 The text – “collectively we support your autonomy” – is inspired by the participatory art projects she has previously initiated, offering a reflection of and comment on the relationships between artist, participant, artwork and audience. The format and placement of the sign references other historic neon in the area, like the Pillsbury Flour or North Star Blanket signs, but rather than speaking to us as consumers, Sheets’ sign addresses us as human beings. The text speaks to our interdependence and responsibility to each other: it is the work of many people coming together, forming invisible structures of support that allows us each to function as self-determined individuals in the world. The sign reminds us of this reality, while also raising the question of how we live up to this ideal. Monica Sheets creates platforms for communication as a means of civic engagement for herself and other participants. She was born in Toledo, Ohio and her experiences growing up in the Rust Belt were pivotal to her decision to work directly with participants, coming from a desire to reach audiences who might not normally visit galleries and museums. In addition to her artistic work, she has worked in different capacities at a variety of non-profit art organizations, including as founder and director of Das Fundbuero e.V., a cultural organization dedicated to creating spaces in which former East German citizens can discuss their experiences of the German Democratic Republic and the aftermath of German unification in 1989.